President University menjalin kerjasama dengan Taiwan Education Center (TEC) yang merupakan pusat informasi pendidikan Taiwan di Indonesia dalam rangka meningkatkan kualitas sumber daya manusia melalui insititusi pendidikan di negara Taiwan. INDUSTRY.co.id - Jakarta - For those of you who want to study in Taiwan it is better to go to the Taiwan Higher Education Fair 2018 exhibition which will be held at the Jababeka Convention Center, Cikarang on 10 August. As many as 37 famous campuses from Taiwan enlivened the exhibition. The implementation of this activity can be carried out well in the three big cities thanks to the support and cooperation between Taiwan Education Center (TEC) Indonesia and a number of educational institutions in Indonesia. In Bandung, the exhibition was carried out thanks to the collaboration of TEC Indonesia with the West Java Language Education Coordination Board (BKPBM). In Jababeka, the implementation of the 2018 Taiwan Higher Education Fair runs because of the great support from President University and Jababeka Group. "Our Jababeka area is aiming for a new market share because many students and parents there are very ordinary with the quality of the world of Taiwan education," said Chairman of the Taiwan Education Center, Rini Lestari in a press conference at Menara Batavia, Thursday (08/02/2018). In addition to collaborating with a number of domestic educational institutions, to present this event, TEC Indonesia also cooperates with leading universities in Taiwan. There are at least 37 universities in Taiwan participating in the organization of this exhibition. Some of them are National Taiwan University, Tunghai University, National Sun Yat-Sen University, Taipei Medical University, Providence University, and Tzu Chi University. 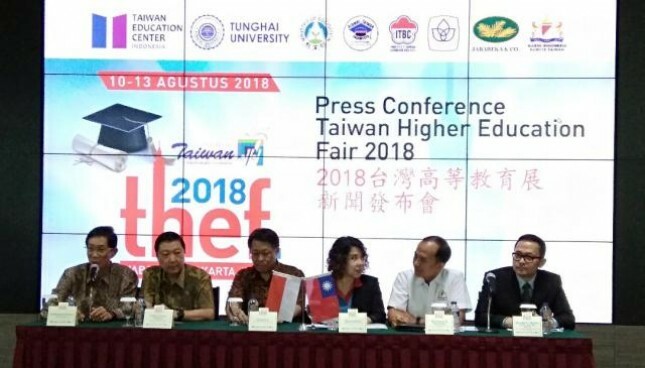 For information, the implementation of Taiwan Higher Education Fair in Indonesia aims to maintain the cooperation and partnership that has been established between Indonesia and Taiwan in the field of education. The exhibition is also a real implementation of the new policy of the Taiwan government, namely the New Southbound Policy, where this policy focuses on strengthening cooperation with countries in South and Southeast Asia in various fields, including the field of education in Indonesia, of course. In addition, the holding of this activity also aims to open the widest access to the Indonesian people about the opportunities and benefits that can be gained if they continue their education in Taiwan. Moreover, currently information on education in Taiwan is still not widely known and utilized by the Indonesian people. "For example, in Taiwan there is already certification for halal food. So Muslims who tour or school there need not be confused about eating every day. Places to pray are also easy to get in Taiwan," explained TEC Indonesia's Chairman, Rini Lestari. Another advantage if studied in Taiwan, continued is a super sophisticated campus facility (very sophisticated). The Internet is cheap and very fast access. The campus environment is also beautiful and beautiful and has a study room that is open 24 hours if you need a comfortable study room. One more thing that is also very important, continues Rini Lestari, education in Taiwan is also very well known with the scholarship program. There are many educational scholarship programs implemented in Taiwan. Some of them, such as the Taiwan Scholarship Ministry of Education (MOE), Ministry of Education and Technology (MOST) Taiwan Scholarship International Higher Education ICDF Program of Taiwan scholarship, and Huayu Enrichment Scholarship (HES) are devoted to learning Mandarin. The Government of Taiwan, continued Rini, will provide funding for educational scholarships and living allowances to outstanding students through a number of these programs. "Through this program the Taiwanese government wants to encourage outstanding students to continue their education in Taiwan. This opportunity can certainly be taken by Indonesian students who want to continue their studies in Taiwan," concluded Rini Lestari.